I wrote this recipe originally to put in my first book, A Little Taste of India, but I made the decision to leave it out because I felt it was too ‘simple’ to charge people money for. The plan was for me to blog it at the same time I released the book, but I never got around to it. Then last week Tandoori Chicken was chosen as the peoples choice recipe, and I knew I had to finally share this awesome raita with you all. 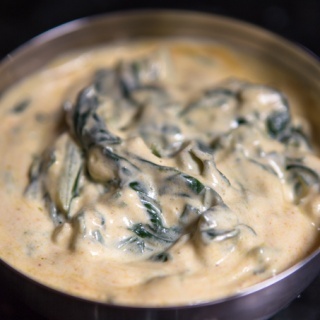 Its a lot more nutritious than your usual raita, thanks to the addition of spinach. Its also really delicious! Give it a go for your next Indian feast and I am sure you’ll love it. Set a full kettle of water to boil. In the mean time, add ginger and garlic to mixer bowl; chop for 3 sec/speed 9/MC on. Scrape bowl down. Add olive oil and cook for 3 min/100°C or 212°F/speed 1/MC off. While this is cooking, put your sliced spinach in a colander and over the sink carefully pour your boiling water over it to blanch. Drain excess water off thoroughly. Add spinach to mixer bowl. Cook for 3 min/100°C or 212°F/speed 1/MC off. Put bowl in fridge for 15 mins to cool. Add remaining ingredients and combine for 5 sec/speed 3/MC off. Pour raita into serving bowl and refrigerate for at least half an hour before serving. Cook garlic and ginger 1 min longer at step 3. « Patè di olive – an international recipe exchange! This is the bomb!!! Love it!!! I was so skeptical making this but it’s absolutely delicious! Make it with your next curry! Really enjoyed this. I used baby spinach that needed to be used up. Oh!!!!! WE LOVE THIS!!!! So much so I had to put it in capitals! I think it would be perfect on everything, toast, a spoon, anything! We always pair it with the Tandoori Chicken. What a delicious Raita. I was surprised by the spinach, it really adds something. 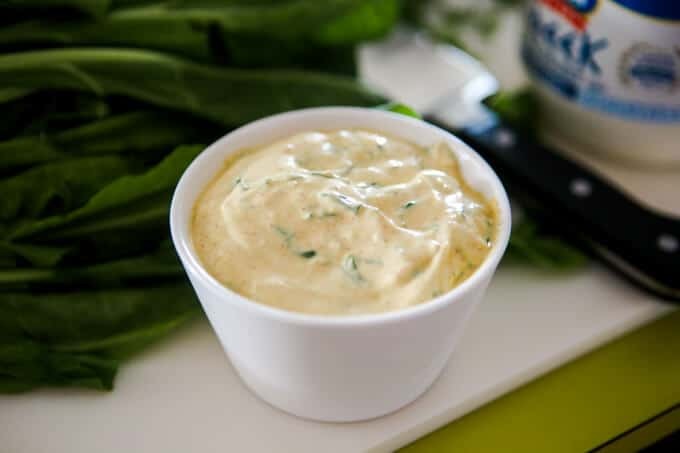 I halved the recipe as my husband does not like yogurt condiments and it worked out well. I also used jarred ginger and garlic instead of fresh and it is still delish. Thank you – I just made this to go with our Chicken Tikka Masala for dinner. It’s lovely! Well this has to be one of the best things I have ever tasted. Hidden away in here is a cracker of a recipe. Must admit when I first looked at it I wasn’t sure it seemed a bit of a waste of time I mean what could it add to a meal really? This is SO yum! I could seriously eat it by the spoonful. Mmm mmm!!! Perfect to go with tandoori chicken. Or for breakfast…ha! Once again another amazing recipe NIK to go with your Tandoori Chick (or anything lol). This is a lovely raita, it feels warmer than the more common cool and refreshing cucumber raita. Do you think I could use this as a dip and serve with nan bread for a party? I make this to go with the tandoori chicken. Scrumptious! OMG nikalene you’ve done it again! This is so delicious and it goes so well with the tandoori chicken!! Winner again! Glad to have 3 more portions of paste in the freezer! Had this tonight with Tandoori chicken. Subbed Baby spinach for normal spinach. Kids loved it with Naan. What else would you put into the wrap? Never really eaten much Indian and don’t know how to eat it! I made this Riata to accompany our butter chicken and Naan etc over the weekend. It was a last minute addition to our meal and I had no english spinach so i subbed it for a rather large handful of fresh mint leaves from my garden (minus the blanching and cooking stage for the spinach) and it was delightful! I served this with some wraps and lamb koftas and it was really lovely. Wonderful flavours and I can’t wait to try it with the tandoori chicken it was planned for later in the week!